Joe Swail failed in his bid to play in the World Championship after losing 10-8 to Chinese player Li Yan in the third round of the qualifying competition. Swail led 6-3 after Sunday's opening session, but was unable to maintain his advantage after the interval. The Belfast player had defeated Alex Davies 10-7 in round one, and then beat Anthony Hamilton 10-7 in round two. 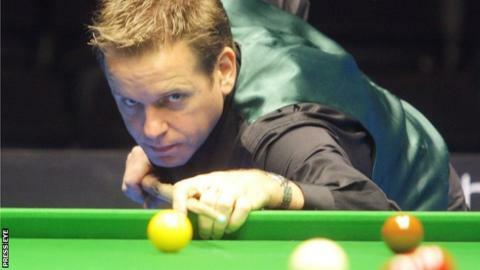 Swail, twice a world semi-finalist, played for a year as an amateur before re-joining the professional ranks. Li Yan will now play Xiao Guodong in the fourth round, with the winner earning a place in the tournament proper, which begins on Saturday at the Crucible Theatre. Kent-based Northern Ireland player Gerard Greene lost 10-8 to Brazilian Igor Figueriredo in the second round of the qualifiers. Greene will have been disappointed not to have put up a better showing after recently reaching the final of the Players' Championship Grand Final, before losing to Barry Hawkins. World number 15 Mark Allen will play his first round match on Tuesday 22 April and Wednesday 23 April. The Antrim man will be in action in the evening session on both days. Fergal O'Brien must overcome Robbie Williams in the fourth qualifying round if he is to be in action next week, while former world champion Ken Doherty faces Dechawat Poomjaeng for a place in the final 32.